Someone is starting to get curious about this "baby" Mom and Dad say is growing in Mom's belly. I keep telling her we are growing her a baby so she can have someone to play with, but she just looks at me like I'm crazy. 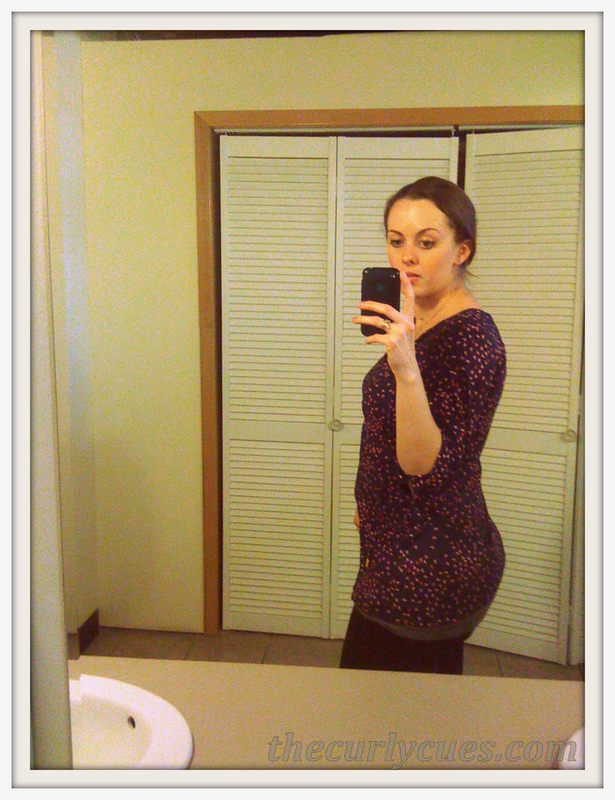 A few people have asked for a picture of my growing baby bump. I'm approaching 17 weeks and I haven't posted a single one, so I suppose it is time. I promise to get better pics in the future, but for now I have this amazing iPhone pic I took in the bathroom at work. You're welcome. The belly is definitely showing up faster this time around. My body said "Hey! I've done this before!" I'm still in that in-between stage where I just look like I've put on a few, but I'm getting closer to looking pregnant every day. Every minute actually. Last thing for today. The lovely Chelsey over at The Paper Mama started up a Self Photo Challenge, go check it out. I, like most moms, am guilty of posting a lot of pictures of my kid and not so many of myself. I don't have a fancy camera with a remote, so a good old-fashioned myspace-arms-out-photo (remember myspace?) will have to do. I took this on a day I actually showered and put on mascara, so that is a plus. After uploading the photo I immediately felt the need to point out all the things I don't like about it, but that is completely against the point! So I'll just leave you with my self-portrait and my answers to the info prompts below. Baby names. I really should stop at least until we know if it is a boy or a girl. I have a girl name that I love (pending Ryan's agreement), but ZERO boy names. Boy names are hard! Gathering ideas for Lily's 2nd birthday party. I know it is 3 months away, but Pinterest has me on idea overload! How much I love Ryan. He is such a great dad, husband and person. I am really so lucky to have snatched him up almost 10 years ago. A trip to Chicago with some of my favorite girls. I will be away from Lily for 4 nights which will be both restful and sad. The sounds of Ryan and Lily reading a story before bed. There is always more giggling than one would expect during story time. A lot of Nutella. Also I have been craving ice cream and then my friend Gracie (who is about a week further along in her pregnancy than I am) posted a pic of a rootbeer float. I had to have one. Ryan went to the store and got the goods. I said get chocolate sauce in case I decide to have a sundae instead. Then I had both. We could win the lottery and never have to worry about money again. If you haven't done it yet, go link up your self-portrait! Ok. I sorta believe you have a baba in there! You are glowing though mama. You REALLY look beautiful. For reals YO. OMgosh. I love thinking of baby names too, boys name are so much harder! I'm not preggers, & I LOOOVE nutella too. I am so bad, I just take a couple (4) huge spoon fulls, put it in a cup, & fill it up w/ milk. THEN... I eat it. Sounds weird but oh sweet Jesus, it is good! Hahaaa... sorry for all the randomness. Is that a word? Boy names are for SURE harder!!! With both of my pregnancies, we had plenty of girls names we both loved and agreed on but no boys names. It takes us forever to even create a semi-decent list. Ha ha. You look so cute, BTW! Can't wait to see that belly in person next weekend! You look so great!!! AH, will I see you next Saturday? I hope so! Yay! Can't wait to see you and your cute belly! Craving Nutella?! It's a girl! I love that shrunken anthro sweater. How long ago did she buy it? You look great! Congrats on your pregnancy....boy names are so hard. I have three boys and it was a struggle.... take care!